Session 438. Third and final session of the day - completing the trifecta! After a souvlaki for lunch in Mentone I drove to Point Leo to meet Stuart W hoping for some kitesurfing on waves. Point Leo is a quiet location with a good campground that was very quiet. There was hardly anyone around and nobody on the beach. I chatted to a couple of lifesavers who were sitting in a buggy on the beach. There was good wind. I cruised out on Union 10 with plenty of power. I headed to Second Reef where waves were forming, avoiding a couple of surfers who were close to the shore. This reef can open up as treacherous rocks I was cautious. I then tacked out to Suicides at the point. There were some good size swells but they were close to the rocks so I headed back to Second Reef. Stuart was on the water by then. We cruised around finding some occasional swells and waves but they weren't big. Then we headed further west over to The Pines at Shoreham. The reef break there is very consistent but again the waves were not big. Session 437. Second session of three today. I got my backpack from the car and stashed a kitebag and my wateproof phone pouch in it. Anthony very generously offered to pick me up from Brighton. I tacked straight to Ricketts Point, then around the corner. Job and Luca were setting up on the beach at South Ricketts and there was one kiter out their. I dodged the reefs and kept going. Closer to shore the wind was lighter with the south easterly running parallel to the shore or even a bit offshore. I stayed out where the wind was good. I swapped feed a couple of times and rode toeside in both directions to vary the load on my leg muscles. The HMS Cerberus wreck is breaking up badly now. It as great to do a pure downwinder and surf swells most of the way. From the breakwater at Sandringham Marina I headed straight to Green Point, but the waves there were small. The festival on there was very busy. I came into Brighton without any difficulty, very happy to have completed this nice short tour. Anthony had just arrived and I spoke to Natalie and Graeme who were setting up for foil board racing. A coffee and some chips at the Brighton Pavilion cafe was great, then Anthony drove me back to Mentone. Session 436. First session of three today. The south easterly wind coming in nicely to Mentone was good for kitesurfing. A solid session with some jumps and long "touring tacks". There were only about 5 kites out, including Stu Styles, James and Anthony. 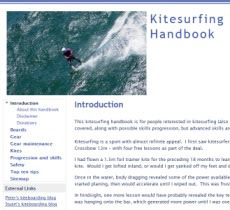 My leg/hamstring was fine, its not bothering me while kitesurfing. The small bay waves were nice too. There were a few Blue Blubber jellyfish of Ricketts Point but not enough to be a worry. The wind direction was good for a downwinder - the next session. Tarren has made this great video of our November kitesurfing trip to Tassy. Enjoy! Session 435. Nice kitesurfing in a fading seabreeze at Ricketts late in the afternoon with the lads. Stu S, Grant and Jop (with his son Luca) were there. Luca is up and going like a champ! My 10m Union kite was going upwind fine and I did some nice jumps. The tide was high so the reefs were not a big issue. The beach is quite narrow and there is a pile of weed washed up on the shore. I was wishing I had my summer booties on but it worked out OK. I am really enjoying the freedom and exhilaration of being on the water again. A downwinder is tempting, but today was not the day. The wind dropped out after 30 minutes. The locals have it easy - bike to kite! Long overdue kitesurfing session at Hampton, back on the water again! Session 434. Back on the water again! Nice wind at Hampton for my 8m kite. So good to be kitesurfing and cruising around. The best thing in life is to be able to do. I kited past several large yachts racing close to shore. The wind was good, there were some nice swells and there was hardly anybody around. I took it easy, my hamstring was fine. I think the exercise will help strengthen it now it has healed.